Smoke smell as a result of a fire, musty or moldy odors that occur due to water damage or flooding, sewage odor as a result of drainage backup or overflows, animal odors, smells that occur through hoarding, and many more. These smells can linger, because the source of these smells may not be easily visible or detectable. That is why you need a professional to address the situation for you. As a property / business owner, you may be faced with unforeseen incidences, such as flooding and water damage, sewage backup, fire, etc. Not only do you have to deal with the damage caused by these events, you also have to deal with the smell that may be left behind. Our technicians at Rainbow International will assist you in locating and eliminating any form of noxious and annoying odor. All of our professionals are certified through IICRC, and are versed in every aspect of odor removal. Serving the communities of Elkton, Pikesville, Joppa, Cockeysville, Bel Air, Baltimore, and the greater Northeastern Maryland areas, Rainbow International has an excellent reputation for quality service in the area of odor removal. Not only do our technicians do an excellent job of solving this annoying issue, they treat their customers with the utmost professionalism and care. Our dispatchers are on-call 24 hours per day—7 days per week—365 days per year. If you ever are faced with odors in your home or residence, please call 410-836-2445 and talk to one of our professionals. We will send help right away. If you experience water damage as a result of a flood, broken pipes, or storm, you may notice an odor after the first 24-48 hours of the accident; usually a rank smell that can be extremely offensive. It is essential that you move quickly, because if you do not eliminate the source of problem, the smell can get worse over time. An unusual smell typically indicates the rapid growth of mold and mildew, which is an indicator of water being trapped in the porous materials within your property. This is the most damaging to your property’s structure, and is a health hazard to your family, friends, and visitors. You need to call the technicians at Rainbow International as soon as possible. Our professionals will immediately begin the process of drying out the structure with our industrial size air movers and dehumidifiers. 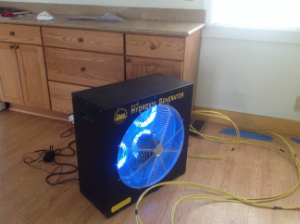 Air movers will circulate the surrounding air, while the dehumidifiers will pull the moisture out of the air. 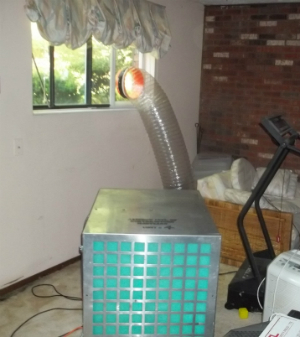 The use of these machines will rapidly diminish the growth of mold and mildew, thus reducing the odor. If water has already been mitigated on your property, but you still notice a smell, we have the equipment necessary to identify the source and remove the odor for good. Smoke odor is one of the toughest to remove, but the certified technicians at Rainbow International will rid your structure of this stubborn smell. Our professionals will locate the sources of the smoky smell immediately, and will look particularly for areas of oily soot, as well as dry soot (protein, natural and synthetic fires). We have at our fingertips the most state-of-the-art technologies in the business, such as environmentally friendly odor-eliminating chemicals, ozone machines, and hydroxyl generators to handle both types of soot. From pet odors to bio-hazard odors, the professionals at Rainbow International can handle it! 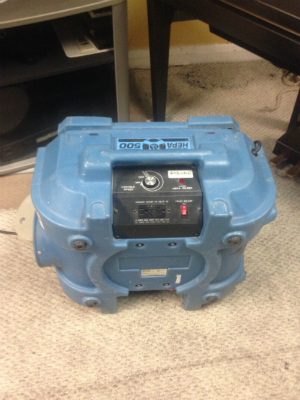 Using specialized equipment such as ozone machines, Hydroxyl technology and other odor-removal equipment, each item in our inventory is designed to tackle the problem at its source. Since every situation is different, our technicians are trained to identify the correct technology to suit the odor. That is where our training and experience comes in. We guarantee that when we leave your home, you will be satisfied of a job well-done. Call the professionals at Rainbow International to handle your odor removal issues. The longer you wait, the worse the situation on your property will become. That is why at Rainbow International, we have dispatchers on call all hours of the day to address your specific need. 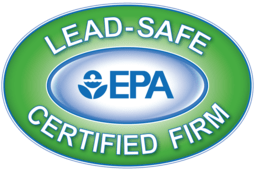 Serving the communities of Elkton, Pikesville, Joppa, Cockeysville, Bel Air, Baltimore, and the greater Northeastern Maryland areas, we have the training and knowledge required to address any odor situation. Need assistance now? Call us at 410-836-2445 to see what we can do for you!